November, 18-19, during the Professional World Cup Zloty Tur-2017 there will be a series of armfights Vendetta All Stars. The strongest athletes of the world are participants of the tournament. Who will we see in pairs? 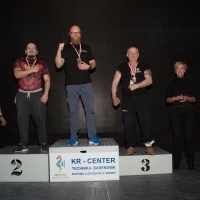 "As the series of armfights will be held in Poland, it is natural that among the participants there will be a Polish sportsman, – explains Igor Mazurenko, president of the Professional Armwrestling League. – It will be Dawid Bartosiewicz, who will once again meet with Brazilian athlete Eduardo Tiete in armfight. Already after Vendetta in Vegas # 45 David told about rematch, and now we will see the continued struggle of athletes on Polish land". This pair of athletes will fight on the first day of the Zloty Tour in the 78 kg weight class. The next pair of opponents is Tim Bresnan vs Gennady Kvikvinia. Last year, Tim Bresnan in Vegas easily won the young Dmitry Silaev, so it's interesting how will end the duel of these two strongmen in Europe. These athletes will also pull on Saturday, November 18. On November 19, we will see the fight of three more pairs of armwrestlers. The first of them is Dave Chaffee vs Dmitry Trubin. Everyone, of course, remembers the Zloty Tur -2013, when Dave won Denis Tsyplenkov in the straps and referee grip, it was a kind of shock. Now Dave has the opportunity to try his hand at heavyweight Dmitry Trubin, who is very responsible for preparing for the armfight. Perhaps, this fight will be one of the most acute in the series, since we can not exactly know the level of training of an American athlete. The next fight is Michael Todd vs Andrey Pushkar. The confrontation of these two athletes has its long history and has become almost legendary. In 2012, in the armfight Andrey lost to Michael Intercontinental Champion title, and this time he is ready to oppose the PAL champion belt. And Michael announced that he was ready to win it back. Perhaps, this couple will also pin the attention of viewers and help to find out who is the strongest. And the last but not the least is a pair of pullers who will play the champion title in the 95 kg category – Rustam Babayev and Khadzhimurat Zoloev. These athletes are fighting in a similar style, but in different weight classes, and their fight will be spectacular, of course. Such will be the card of the stellar Vendetta at the Professional World Cup, which, perhaps, will become a very intriguing and interesting tournament. Join us and stay tuned for Zloty Tur-2017!